Mizuhiki is a very old art form in Japan. It is also the word used to describe the product. 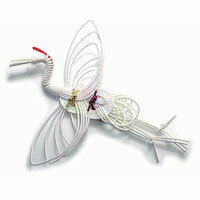 Mizuhiki cord is a strong fiber made from the inner bark of the kozo plant, also known as Washi paper. This fiber is wrapped in silk creating a flexible yet durable cord. It is then used to create many beautiful embellishments. There are artists who make sculptures out of mizuhiki. Like many art forms the material is simple and the artist is invited to take it to great heights. Mizuhiki cord has a special place in gift giving. In Japanese culture, the presentation of the gift is often more important than what is being presented. Packages often have a special care given them or special trim. When giving money for a gift, the cash will often be wrapped in an elaborate way, using special paper and tied with mizuhiki cord. It is a sign of respect and honor. We have an assortment of Mizukiki art supplies including Mizuhiki Ribbons and Strands, Assorted Packages, Mizukihi Embellishments and Instruction Books.